Help SONE earn a $1,000 donation! Help Special Olympics Nebraska earn a $1,000 donation!! Calling all SONE Champions--we need you! Family Fare Supermarkets has teamed up with Metro Community College’s Institute for the Culinary Arts to highlight the fresh, local ingredients and cost savings available at Family Fare locations throughout Omaha. The Perfect Picnic contest is part of the celebration taking place all this week at eight newly renovated Family Fare Supermarkets in the Omaha area. Each vote also automatically enters you in a drawing to win a $50 Family Fare gift certificate! The student winner of the popular vote will have a $1,000 donation made to a local charity in their name. 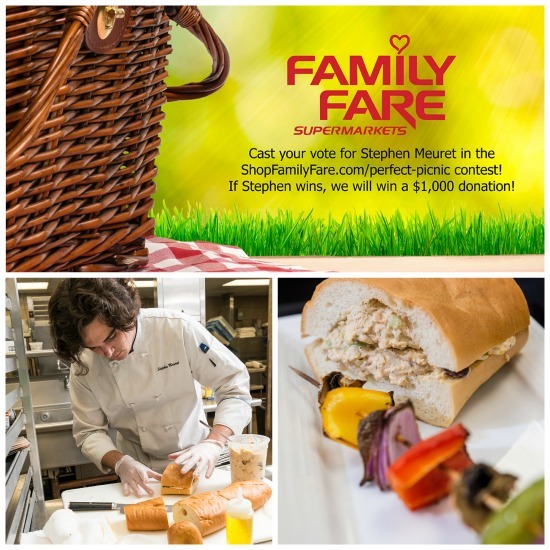 Cast your vote for SONE’s chosen student: Steven Meuret in the ShopFamilyFare.com/Perfect-Picnic contest! If Stephen wins, SONE will earn a $1,000 donation! Take a few minutes to vote to support SONE! Stephen has been an MCC student for a year and a half, working towards a job in the industry after graduation. His favorite class at the Institute for Culinary Arts is protein fabrication. For the Perfect Picnic contest, Stephen prepared Picnic Chicken Salad, Vegetable Skewers, and a Strawberry Lemonade Spritzer--yum! Keep up the hard work, Stephen! SONE is rooting for you!